Jill Seiler is the co-owner and marketing director at Seiler Skin. She attended Gadsden State Community College and Rocky Mountain School of Photography in Missoula, Mont., where she received her degree in photography. Jill spent several years working as a freelance and commercial photographer before transitioning her career toward marketing and advertising. Prior to meeting Dr. Seiler and joining Seiler Skin, she spent seven years working for a publishing company helping businesses align their communications initiatives with strategic business growth goals. Through this experience, she further refined her leadership and business development skills – even participating in an intense mentoring program with a professional leadership coach. 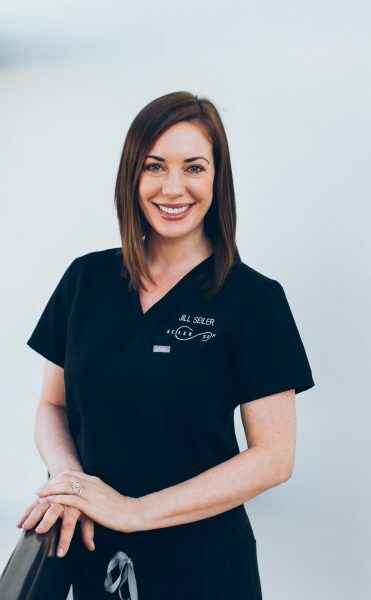 Jill applies this knowledge and expertise in her role at Seiler Skin, and has been integral in the practice’s continued growth and success. Through her role as Seiler Skin’s marketing director, Jill found her true passion in helping patients achieve their skin health goals. As a result, she committed to learning as much as possible about the industry, both through formal training under Dr. Seiler on laser theory, skin anatomy, medical-grade skincare and cosmetic treatments, and through private medical trainings at ongoing education seminars. She has applied this knowledge in many capacities – including conducting patient consultations and educating patients and staff members on the importance of developing a medical-grade skincare regimen. Jill enjoys spending her free time with her husband, Dr. Seiler, and their two dogs – Play-doh and Birdie. When she is not busy helping patients and growing the practice, she likes to spearhead new restoration projects at their 100-year-old historic home, and search for their next restaurant or concert experience. Fun fact: Jill still loves to put her gymnastic training to the test by doing front- and back flips at the local trampoline park. Dr. Seiler just watches!